Born in Pointe Anne, Ontario. 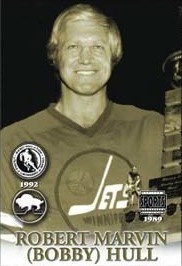 In six WHA seasons with the Jets, this left winger played 411 games, scored 303 goals, 335 assists, 638 points. He was League MVP in 1973 & `75 and was twice named to First and Second All-Star teams. He won two Avco Cups (1976 & `78). The Jets retired his #9 sweater in 1989. In 16 NHL seasons he played in 1,063 games, scored 610 goals, 560 assists, 1,170 points. He won a Stanley Cup with Chicago in 1961, the Hart Trophy twice (1965 & `66), the Art Ross Trophy three times (1960,'62 & `66), and the Lady Byng Trophy (1965). A ten-time First and two-time Second NHL All-Star, Robert Marvin (Bobby) Hull is in both Canada's Sports Hall of Fame and the Hockey Hall of Fame.